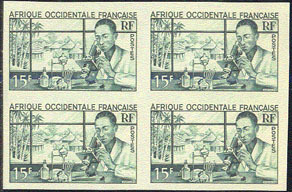 7599 ESS FRENCH WEST AFRICA (1953) Medical laboratory*. Microscope*. Trial color proof block of 4. Scott No 59, Yvert No 48. 10179 ESS AFRIQUE OCCIDENTALE (1954) Hunting and fishing. Trial color proof strip of 5. Yvert No 49, Scott No 60.